COLONIAL CANDLE LAMPS home decor, jewelry, decor, decorations, electronics, fountains, floor mats, art glass, vases, garden essentials, fireplace screens. Quaint colonial styling and a sleek, modern matte black finish make this lamp a winning addition to your décor! Your favorite votive candle looks lovely at center stage behind six clear glass panels; just the right accent to make any evening into a special occasion. Candle not included. Material(s): IRON, GLASS. Weight 1 pounds. Dimensions 5" x 5" x 9.5". 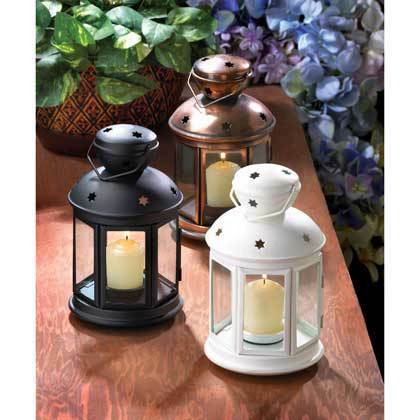 Traditional candle lantern gets a fresh contemporary look with matte white finish and charming star cutouts! A simple yet elegant complement sheds festive light on any setting. Candle not included. Material(s): IRON, GLASS. Weight 1 pounds. Dimensions 5" x 5" x 9.5". Cutouts and glass windows gleam with reflected candlelight in this colonial-style metal candle lamp. Bright burnished finish and a wire hanging loop. Candle not included. Material(s): IRON, GLASS. Weight 1 pounds. Dimensions 5" x 5" x 9.5".